Writing this piece is one of the most personal things I’ve ever been asked to do, and perhaps one of the most difficult as well. When discussing Stoicism and its therapeutic effects on persons with post-traumatic stress, what could I add to the new Stoa that Donald Robertson hasn’t already covered with his Stoic cognitive behavioural therapy? Or to the work of Thomas Jarrett, who applies Stoic principles in his mental-health course, Warrior Resilience and Thriving, which helps instil ‘post-traumatic growth’ in our warriors so that they may move forward with their lives? Let alone to the heroic account of the Stoic fighter pilot James Stockdale, who underwent a brutal, Epictetan experience for years as a prisoner of war in Hanoi. I might, however, be able to participate in the Stoic dialectic by adding another first-hand account of one more former soldier who, lost and reaching out from the abyss, found a hand grabbing mine in that spiralling chasm of anger, despair, and grief. One more person who, in reading Epictetus, took the hand of a crippled and scarred former slave- a hand that slowly began pulling me out of the darkness. If this is the story I was asked to tell, then lead me, Zeus, and begin the way you see fit. I couldn’t sleep well for years after the war. I took night jobs and ruined relationships. I was stone-faced and ‘unfeeling as a statue’ when I did, and yet would sometimes cry uncontrollably at scenes of injuries from explosions and gunshot wounds in documentaries. Not all gunshot wounds though; just the ones from the AK-47. Similarly affected, some of the soldiers I had served with had believed they found some vestige of respite in drugs and alcohol. I had a close comrade who, one night a few months after being kicked out of the Army for drug abuse, took too much of both. To say it was suicide would suggest some thought-out intention, an act of will- an answer to Albert Camus’s only serious philosophical problem. Rather, it was one last random desperate act in a short post-war life full of random desperate acts. Is there balm in Gilead? Is there philosophical life after post-traumatic stress from the war? Can the Stoics convince us that virtue is the only good? That vice is the only evil? That all else is indifferent? Even if that ‘all else’ means being burned, being maimed, seeing others mangled and torn? Their ears burned off and their eyes blinded by fire and explosives, staring vacantly, asking us if they ‘can go to sleep now’? Even if that ‘all else’ means children too charred to scream? Or the Iraqi woman, quietly hovering over her limp, mangled child, somehow impossibly still standing on her own shrapnel-shredded legs? Or that recurring memory of the road-kill we run past that we realize is in fact the top half of someone’s head, blown a block away by the winds of war? Soldiers are tough and bold, and we make light of it all at the next meal, getting it out, seemingly unaware that there’s still someone else’s blood on our uniforms, our hands, underneath our fingernails. We forget for the moment. ‘Things seen by the mind, whereby the intellect of man is struck at the very first sight of anything which penetrates to the mind, are not subject to his will, nor to his control, but by virtue of a certain force of their own thrust themselves upon the attention of men; but the assents, whereby these same things seen by the mind are recognized, are subject to a man’s will, and fall under his control. Therefore, when some terrifying sound comes…or something else of the same sort happens, the mind of even the wise man cannot help but be disturbed, and shrink, and grow pale for a moment, not from any anticipation of some evil, but because of certain swift and unconsidered motions which forestall the action of the intellect and the reason.’ – Gellius, 17.19 [Oldfather’s translation, slightly modified]. As a slave, Epictetus had been crippled by a cruel master, and his many references to chains, sword, rack, and scourging in his few discourses is a window to what his former life may have been like and what he had witnessed done to others. I doubt very much that he would not have been affected, at some level and early in life, with some semblance of what we moderns call post-traumatic stress. What he guides us with in these matters is this: for those of us grappling with these symptoms – hypervigilance, the first stirrings of grief, of anger – we might accept that we have them, perhaps ‘cannot help but be disturbed’ by them at first, and yet come to terms and realize that these impressions are not in themselves terrible. Nor must we necessarily accept that they represent something terrible. If, as the Stoics say, ‘the business of life is being a soldier’ and ‘life itself is warfare,’ then we can accept that we may now, and perhaps always, have these recurring thoughts and feelings of our formidable ‘sojourns in a foreign land’ that “thrust themselves” upon our attention. The first Stoic, Zeno, with an admirably resilient dismissive attitude, calls these ‘lingering scars.’ Seneca even suggests they can be lessened over time. But what are they, for a Stoic like Epictetus? Impressions. Impressions and nothing else. Not the impressions of something morally good, or morally bad, but merely impressions of past trauma. What did we expect to happen in life and war? We often choose to assent to these ‘cruel and harsh’ impressions. We allow ourselves to mistakenly believe that death is an evil, that injuries and pain are evils; that comrades should not die. That something bad has happened when nature, Zeus, calls his elements back to himself – whether those elements are momentarily in soldiers or children. To believe all this is unreasonable and, to keep with the ancient pantheism, impious. It is to fall in love with fantasies and externals; to fail to understand necessity and nature- our own and the world’s. We can, however, accept that a certain type of animal, with a certain neurochemistry and disposition, may perhaps necessarily experience something of the sort after a traumatic event. We can, and perhaps will, shake, become pale, perhaps occasionally even weep. There is no shame in this when it is beyond our control. But we, the rational animals, can also do this without experiencing a violent passion, without assenting that something bad has happened to us. We need not identify with our impressions. The ancient Stoics show us that a rational animal can accept necessity, and to some extent comprehend the web of causality – the mind of Zeus. We can grow past our once-painful experiences and become better people because, in themselves, these impressions are nothing of moral value. Whether we will or not is up to us. Oldfather, William Abbott (1998) (Trans.) Epictetus: The Discourses as Reported by Arrian, the Encheiridion, and Fragments. Cambridge, MA: Harvard University Press. 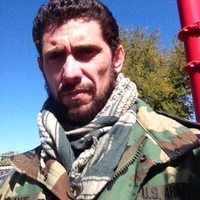 Leonidas Konstantakos became a special education teacher after the Army, has a Masters in Liberal Studies from Florida International University and adjuncts philosophy at night. He has more papers on academia.edu if anyone wants to read further. I remember you from an Autism endorsement class we took together at MDCPS. This comment is not a critical point of view regarding the value that this article brings to the issue of post-traumatic stress. Rather it is about personal uneasiness. Every once in a while, I get conflicting feelings when I read posts about „our warriors” and „a brutal experience in Hanoi”. On the one hand, I like to see actual people in real life situations coping with difficult situations, and these are the kind of human experiences that best illustrate virtue. I need real people to comfort me in my moments of doubt. On the other hand, it feels like they are, like Epictetus use to say, people on their way towards wisdom. Better people, people nonetheless – in a historical and national context. It’s true that the ancients considered defending one’s country a virtue, but somehow I never get this feeling when I read them. Maybe because of the time lapse I don’t fully grasp these small details. Still, it feels like a shortcoming from a general human point of view. It takes a homeland to make a warrior (in an earthly way), but isn’t it better to make Earth our homeland in the first place. I very much liked your piece, and thought of Stockdale’s words “You must never confuse the faith that you will prevail in the end with the discipline to confront the most brutal facts of your current reality”. One thing I do not think you touched upon is the “morally hygienic” effect of living in a modern culture; unlike M Aurelius and Epictetus, we were not raised in a world of manifest unfairness and inequity. In their time, power was the touchstone of society not rights. Ancient people had to make sense of a much more chaotic, indifferent and non-uniform world; one where opinion and caprice WERE more important than consideration, discourse and logic. The fact that we are NOT exposed to depravity and mutilation are what make it so difficult to understand Epic T’s words. We can choose to view scenes of horror and war on the internet, but this is precisely it; we choose the circumstances and the measure of what part of human nature we expose ourselves to. A soldier and a slave do not and cannot. We can remember his words; “I must be put in captivity and go into exile, but must I go with sadness and lamentation?” This is a reminder that we as individuals did not choose or create the state of the world or society or nature but that we have immense power over it, the power of self. If society chooses to do evil; we may be forced by law to participate in that evil. But we do not have to become evil in our hearts thereby. If other people judge us for the outcome of that dilemma; did they face it? Thanks Brian, glad to hear you’ve stumbled onto Stoicism as well. KT, so glad to see this posting. It has been a long and still continuing process for me some my time in the sand. I have certainly achieved a new level of understanding regarding my own morality. I agree that the will is up to us to grow past those dark impressions. I no longer allow them to define my value. Keep on the path buddy that is the medicine ! Thank you all for taking the time to read it and for the kind words. Despite its shortness and simplicity it was very challenging to write. Wonderful post, Leonidas. I have never suffered anything close to PTSD and I doubt that I would be able to distance myself from the disturbing images that people experience in war but I admire efforts by yourself and others to continue living one’s values in spite of the scars you carry. I believe that those who have been through war might find a kindred spirit in Viktor Frankl. Read with interest, thanks. I am just curious to know whether people who suffer PTSD also experience what you touched on, i.e. post dramatic growth, or whether PTSD is too overwhelming, at least initially. Excellent. Quite brilliant and with much to offer in my opinion. I am an admirer of James Stockdale. When I had problems his account of savage imprisonment, and Epictetus, put my difficulties in perspective. I also like “Stoic Warriors” by Nancy Sherman where she writes about disabled military and how they might cope.